Instagram ad revenue is said to reach $2.81 billion USD by 2017. That’s almost 10% of Facebook’s annual profit. That’s a lot of money and a lot of ads. 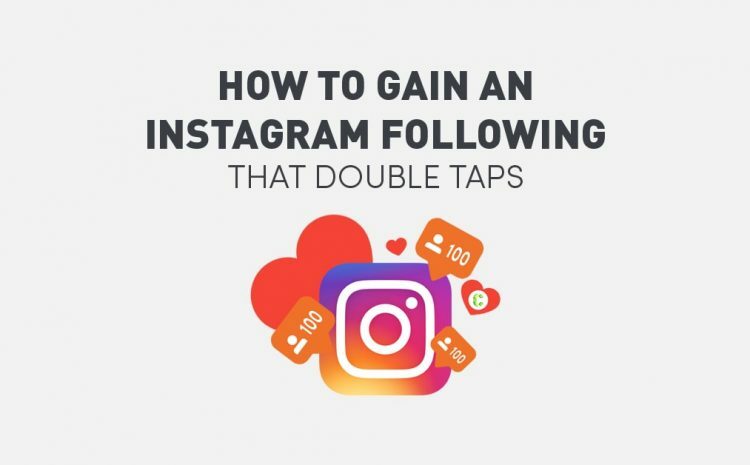 This is why we’ve created this blog about Instagram advertising that you need to know about for your business. Previously, we looked at the Instagram and what works on its diverse platform. 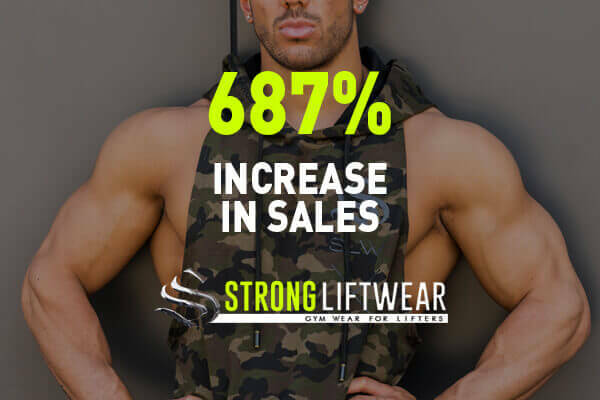 We looked at some of the brands that are doing well, the advertising tactics they implemented and the demographics they targeted which led to their success. Front and centre on Instagram are their users, whose numbers now lie in their hundreds of millions (300 to be exact), and we agreed that Instagram was smart not to bombard users with ads. Instead, through keeping ad content uniform, Instagram can look at a different approach. We’ve comprised a short list of 5 different things to consider when starting off on Instagram. 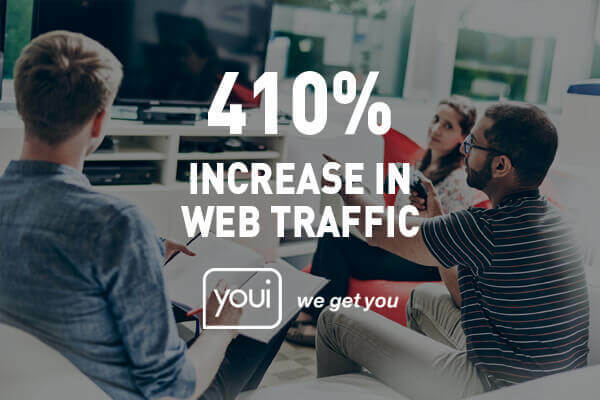 They’ll maybe save you a little bit of money on not having to pay for advertising on the platform, but they’ll also help you achieve greatness when you’re steadily creating content that your audience loves. While once upon time, relegated to the bottom of a phone’s dialpad and gradually losing its importance, what we once called the pound symbol lives on today as the hashtag – #. Hashtags were popularised by microblogging platform Twitter to make it easier to search, curate, and follow content that’s relevant, timely, and trending. Things trend if there’s a frequent recurrence of the same hashtag or keyword, that then grabs people’s attention to see what’s making it rise to popularity. Usually, a post will end with a series of hashtags that are directly relevant to what the post is about. They can appear as part of #text or appear at the end of the body copy, but no matter where you put them their purpose is to attract readers to your post. It leads them in the right direction and, if used correctly, will help garner eyeballs to where you want them to go. It’s very important that your hashtags are relevant: this is both best practise and makes your brand look good. There is one exception to this, however, and that is if you merged your brand’s image or identity with something not directly related to your brand. Sydney food delivery startup Yello actively adopts this practise with their Instagram posts that sometimes include things like ferraris, submarines, and muscle cars. While not directly related to their service (as they may not be using submarines to connect people with the lunches (yet)), it’s still on brand with its colouring and associated copy. Campaigns and promotions can benefit here if you were starting your own hashtag to get people involved with your idea. Most recently, ride-sharing app Uber ran their own hashtag: #ubericecream to promote their campaign that brought ice-cream to people through their car riding service. People who took part in the event could use the hashtag or those who wanted to take part would use the hashtag. With this level of thinking, you’re on the right track to start producing some amazing content to share on your Instagram account. The type of content, now, is what’s next to think about. If you’re a service and don’t actually have a product that you can showcase on your profile, there’s a way around this. Look at what your strengths are and play to these. If you’re providing a service, then show that off! If you’re not, then show off the solutions or outcomes that your service provides. 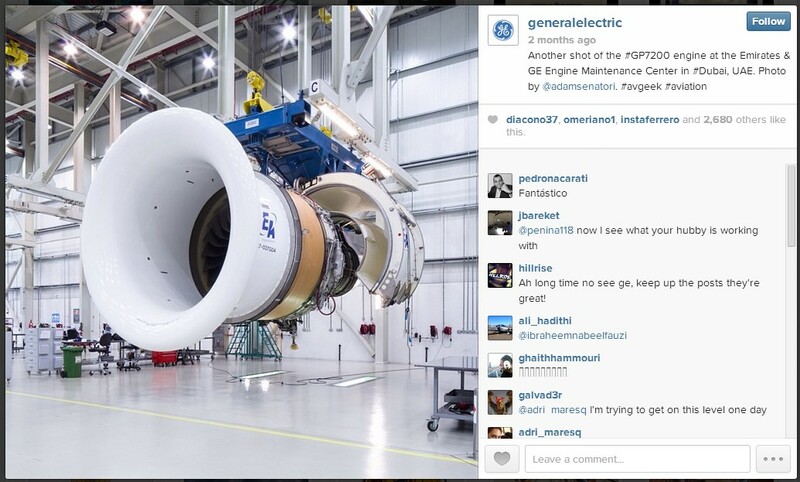 For example, General Electric have a whole range of products and services and they use their Instagram account to show off their environmental messages of conservation while at the same time giving followers the chance to see the business from the inside. While it may not be the best idea for every brand, sometimes you can piggyback off of what your Followers are actively posting about. Social challenges, trending world activities, or other major events like the Olympics are the perfect opportunities to share relevant content but make sure it’s on brand! Examples could be charity events like the ALS ice-bucket challenge, but those that took a creative spin were those who stood out. If you’re looking for ideas, though, look around and see what your competitors or other businesses are doing. Don’t get jealous, get inspired! Look at what’s working, what’s garnering lots of Likes and Comments and think about how you could do it better! Look at ways your clients, customers, friends, or employees are engaging with your service, doll it up and get it ready for Instagram! If you’re a professional gardening service, then there’s always the chance for you to show off your brand’s key features and benefits with some creative images. Style a message out of twigs, look at ways to broadcast and restyle your office space, so stay inspired there are some truly creative ways to market yourself! Also, it’s best to try and humanise your interactions where you can including behind the scenes shot or features about the people who make your business great. If you’re in the B2B market then share or create content that shows off your successful relationships. Also, don’t forget to hashtag. 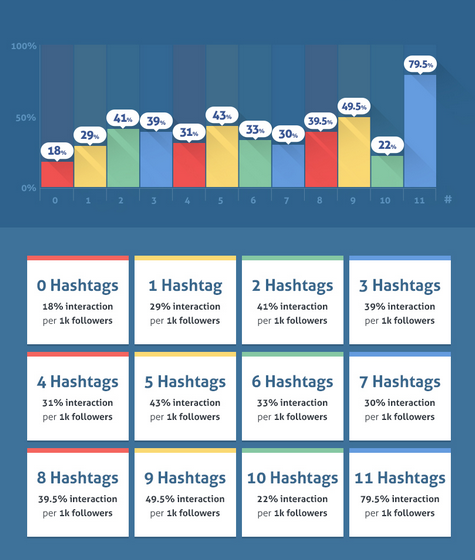 There are a range of tools available to you to check to see whether your hashtags are going to be reach a big enough audience or not. Web-based apps like Hashtagify allow you to search various keywords to see which hashtags might work best for you. When it comes to inspiration, however, there is no better source than your fans. 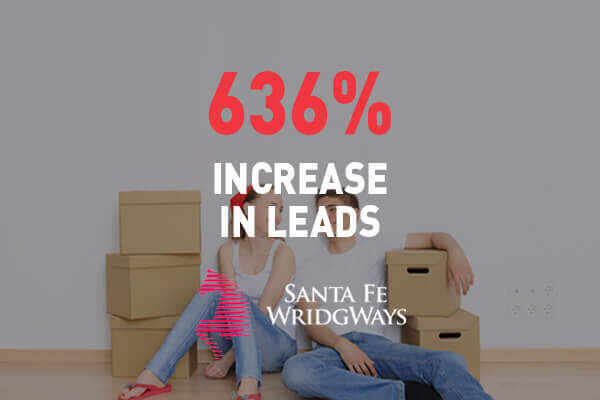 See how they engage with you and ensure two-way communication where you can. It’s always good to give back! 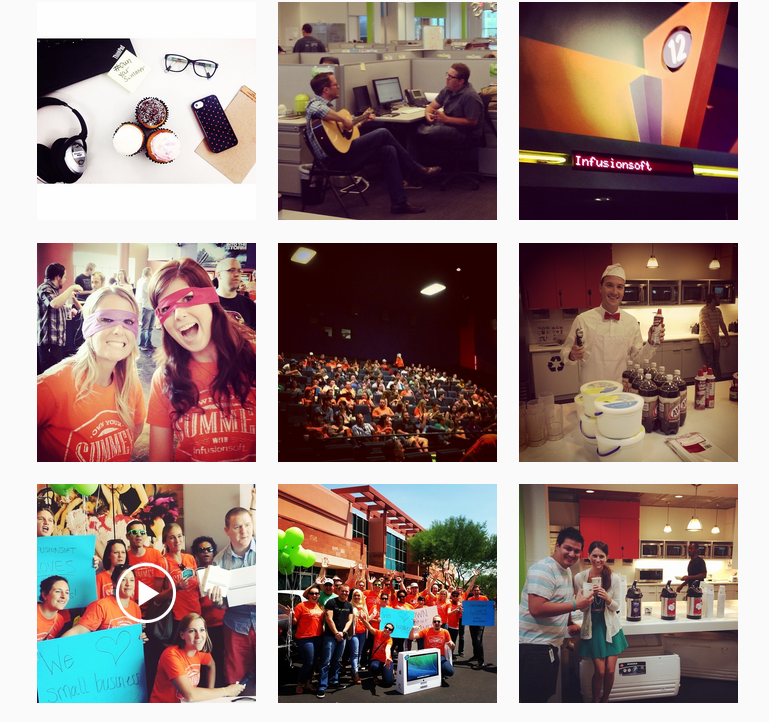 Take for example email marketing company Infusionsoft, who utilise their Instagram account with internal photos of their staff learning together, contributing to the company, and genuinely having fun. Activities such as these often present your business as friendly, approachable, and most of all, human. 5: Make Your Brand Beautiful! On Instagram’s main blog they encourage users to give people a reason to follow your account: “Show how your company sees the world and make it meaningful to people.” Instagram has made it pretty clear that that is the type of posts they want to see, because they meet the Instagram aesthetic. There has been some recent chat about this, but it’s best to have clear, crisp images that show your business off in the best possible light and Instagram gives you the tools to help make this happen. Simplicity is best with Instagram, but don’t be afraid to get creative with this too. Through the use of filters, Instagram allowed people all over the world to become fantastic photographers, now businesses can take part in pushing the strength of their goods and services through the lens of gorgeous filters. Instagram also allows you to photograph things using the golden ratio, which is that grid that you may have noticed before. This is a photographic technique used in photography and cinema to get the eye to focus on certain parts of an image. Make sure you line up areas of the photo you want people to focus on by putting them on these lines, and you’ll see what we mean. Once you’ve made your own brand beautiful, see what your followers think and run a feature promotion where you can ask users to take a styled image in the essence of your business and promise to feature the best one. Create a hashtag that’s specific to your business and this engagement competition and you’ll easily be able to see who’s saying what great ideas your followers have. Now, you’ve got your hashtags, you’ve captured some amazing shots that are exactly what your audience are after, and your style is on-brand. You can’t just sit back and relax though, now this is where the fun starts! Now’s your chance to chat to your audience, see what they like, and improve off of what they tell you! What did they like, what didn’t they like as much? Your followers will let you know, don’t worry about that, but use their comments as a way for you to continually improve your product. Try and comment back to everyone who comments you so you can build a relationship with them over time. Eventually, you’ll have built a positive rapport and one that your community loves to return to! Remember, also, that every interaction with a follower is an opportunity to turn a customer into an ambassador. High-end fashion brand, Burberry, use Instagram like any user would and showcase their branded products in their photos naturally rather than place them on a pedestal like a window display. 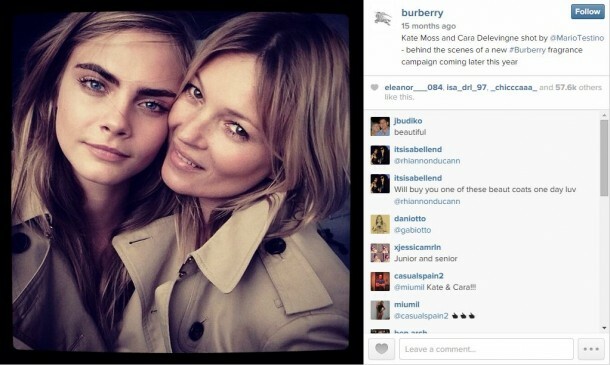 Burberry understand that Instagram users don’t use the platform to be marketed to, and is one of the main reasons why Instagram hasn’t gone crazy with its advertising strategy, and slowly opened it up for other businesses to access over time. Then there are much smaller brands like e-commerce store Bonobos, who use their customers as their models. Praised for using their Instagram account smartly, Bonobos leverage their fan following to submit their own photos of them modelling their clothes and successful ‘models’ get featured on the main account. Their photos are clean, clear, crisp, and aren’t too busy. These are attributes that are consistent across brands who have mastered Instagram and something you have to address when looking to market to your audience. We have emphasised the importance of knowing your audience and ensuring that the content you create for them is in line with Instagram’s aesthetic. Understand the numbers is one thing, but not following it up with the right actions could be disastrous. Now, we’ve clarified why making sure you know what types of hashtags to use means that you’ll be pooling content in the right places and smartly choosing tags that are complementary to your posts. Playing to your strengths allows you to create posts that work for you and your brand and they’ll feel like they belong on Instagram, because they’ll match the same aesthetic. Don’t get lazy either, look at what Instagram’s best are doing (as well as your competition) and stay inspired. Think of Instagram as a great canvas for you to show off your business in the best possible way. 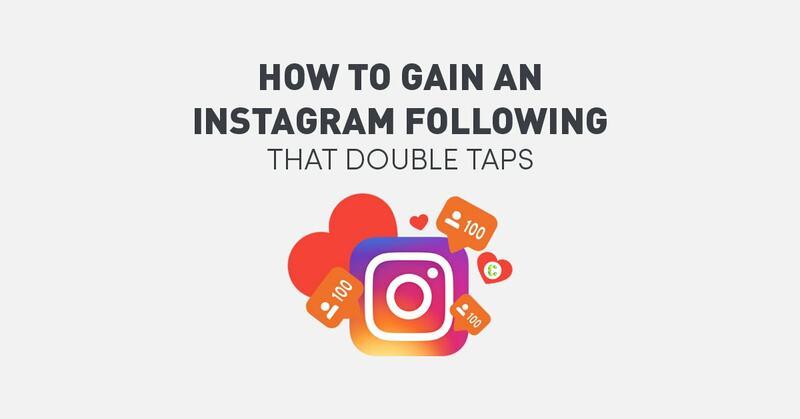 With these powers combined, you’ll be in good standing to take Instagram by storm and interact with your engaged audience in a meaningful way. What sort of photos work best for you in your business? Let us know, we’d love to hear from you!